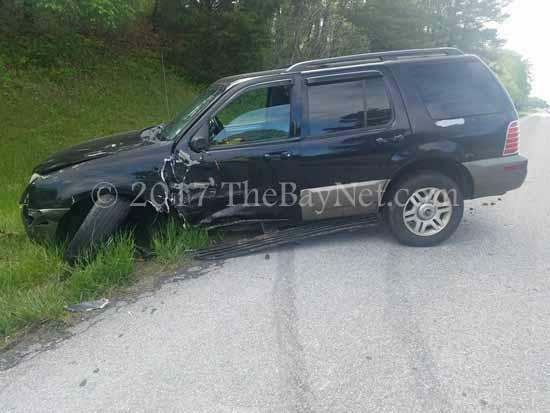 At 15:32 hours on April 26, 2017 Company's 1, 19, and 79 were dispatched to 27780 Point Lookout Road in the area of the Loveville Post Office for a personal injury accident. Squad 1 (Chief 1B) and Engine 10 responded shortly after dispatch. Squad 1 was first to arrive on the scene finding a two-vehicle crash with one vehicle on the roadway, one vehicle off the roadway, and one patient trapped inside the vehicle that had left the roadway. Chief 1B established the command and crews went to work to extricate the trapped patient. A door removal and roof flap was required to access the patient. After further assessment it was determined that the trapped patient would need to be flown to a local trauma center. Command requested a Medic Unit (SMALS) and a helicopter for the transport. Engine 10 established a landing zone for Park Police Eagle 2 who transported the patient to the trauma center. A second patient was ground transported priority 3 to Medstar St. Mary's Hospital. Command was terminated and units returned to service once the patients were enroute to the hospital. Company 1 responded to this MVA on April 26, 2017. Photo courtesy of thebaynet.com.